Love modern sofas and want to keep the convertible sofa bed option, here is a cool idea from Momentoitalia that will fool even the most discerning furniture connoisseur. Designed by Studio R.E.S. 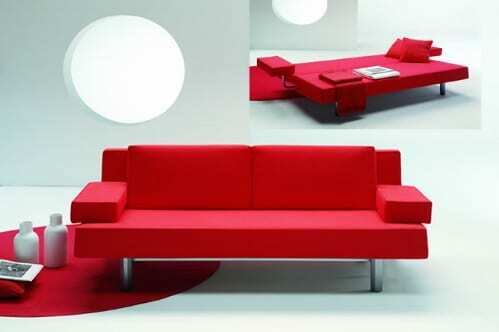 the “CinoGrande” has been a very successful Modern Sleeper Sofa Bed working perfectly in the small space lofts and compact environments of today’s inner city dwellers. Simply turn the sofa armrests on the outside, take away the back pillows, pull the handle, and your bed is ready to go form this unassuming super sleek modern sofa! Momentoitalia has a great collection of furniture made in Italy of coarse. Appx 12 weeks delivery. $3400 W 86.6′ D 37.1 H 30.7.